Hamilton Dental Access provides the coverage that dental insurance can’t. You get exams, x-rays, cleanings and, for children, fluoride twice per year, as well as access to preferred rates on all of our other services. From the beginning, Hamilton Dental Access saves almost 50% for bi-annual services that everyone needs. No costly payroll deductions, no limits, no uncovered services. Simply great care for less. Comprehensive oral care for a lifetime. 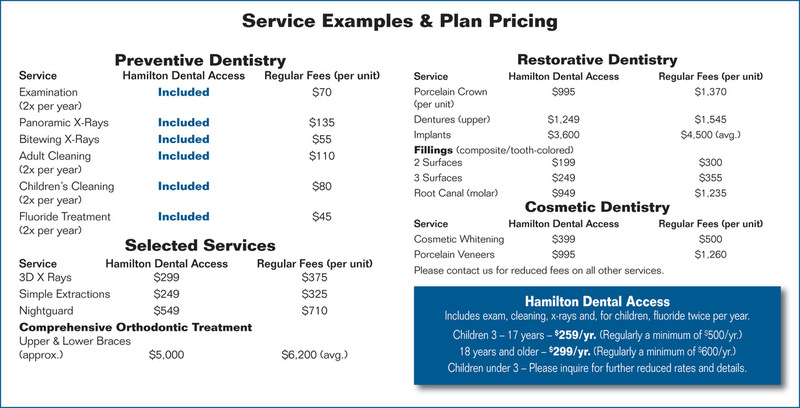 Interested in how you can save with Hamilton Dental Access? Please fill out the form below for more information, and someone from our office will contact you within 48 hours.